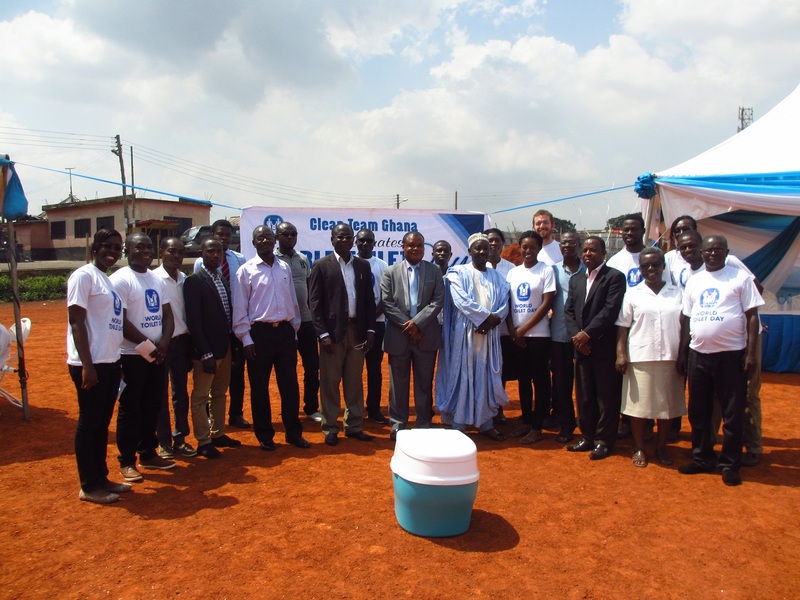 We would like to congratulate our client Clean Team in Ghana for its contribution to the World Toilet Day. “Sanitation continues to be one of the world’s great problems – and Ghana is second in the world for open defecation behind Sudan” says Emmanuel Ntosu, Representative of the Mayor of Kumasi Hon. Kojo Bonsu. As basic sanitation problems continue to plague the developing world, World Toilet Day served as an opportunity for Clean Team to acknowledge and educate the public of Kumasi in Ghana about the importance of sanitation and its adoption. Clean Team, subsidiary of London based Water and Sanitation for the Urban Poor (WSUP), services portable toilets for low income inhabitants of Kumasi for a fee. The toilet costs nothing and the service fee is typically less than the family collectively spends on the public toilet and often helps to establish a sense of pride in their home. The staff of Clean Team organized the event to promote their service with the support of the mayor’s office and other key influencers. There were several speeches, sanitation trivia with prizes, and a free health clinic that tested for Malaria, Hepatitis B and others. Manasseh Narh (Clean Team’s Head of Sales) promoted their new mobile pay system with Tigo Cash which enables its clients to pay for the service electronically rather collecting fees with a special visit. Mobile pay systems have gained popularity in other African countries and are starting to get attention in Ghana.